You may have read about the initial incident over at DOT a month or so ago, where security for the picturesque new headquarters are harassing anyone who might try to photograph the art installations in front of the building. There’s a new wrinkle today, as the ACLU has issued a letter (click on the above to read it) to the General Counsel of the DOT requesting a clarification of the policy and what it’s based on. If you want a full treatment of the policy as it stands, check out the DC Photo Rights Flickr Group’s lengthy and thorough treatment of the situation. Photography isn’t a crime. We’re not terrorists, we’re artists. 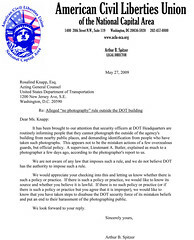 Training your security staff to threaten and detain photographers is a waste of time and of tax dollars. My experience has been that they will ask for your name but then let you continue photoging. Should I be upset about having to give my name, probably. Did I comply and continue taking photos, yes. For what it matters the guard who approached me was very polite, though she did make it a point to repeatedly tell me “we are not telling you that you can’t take photos, we just need to get your name”. Sooo I’m probably on some list now…oh well. Glad that you’re not being told to scram, mhoek! Several others, though, are being sent away, with instructions not to return to shoot again, which is pretty obnoxious. we were there over a year ago and were taking pictures in the outdoor museum area when we were approached by a guard and told that we were not allowed to take pictures in the area, under any circumstances. When we asked what the problem was, we were told it was illegal to photograph public buildings in Washington DC. We left, floored by the absurdity.